The first effectiveness evaluation was completed in May 2009 at the fourth meeting of the Conference of the Parties, while it was noted that the procedures for the evaluation stage of the effectiveness evaluation were not defined at that time and an ad hoc working group was established for this purpose. At its sixth meeting held in May 2013, the Conference of the Parties adopted the framework for the effectiveness evaluation. At its seventh meeting held in May 2015, the Conference of the Parties elected the members to serve on the effectiveness evaluation committee until the close of the eighth meeting of the Conference of the Parties. The first six-year evaluation cycle, using the adopted framework, took place between 2010 and 2017. The effectiveness evaluation committee met from 16 to 18 February 2016 and from 4 to 7 October 2016, in Geneva, Switzerland, to conduct the effectiveness evaluation according to the adopted framework and develop conclusions and recommendations as to the effectiveness of the Stockholm Convention. 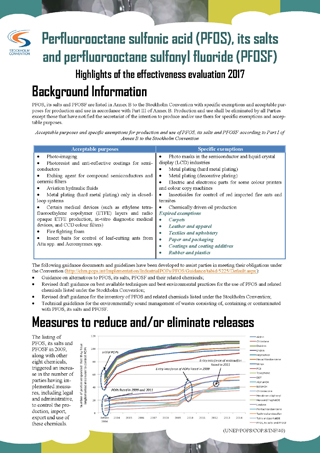 The executive summary of the effectiveness evaluation report is available here. For the first evaluation cycle, in accordance with the effectiveness evaluation framework, the committee was also tasked with evaluating the framework itself and making recommendations for changes. The committee concluded that the framework for effectiveness evaluation adopted by the Conference of the Parties at its sixth meeting provided a good basis for conducting the first evaluation cycle. Based on the experience in using the framework in the first evaluation cycle, suggestions have been made to improve it for the next evaluation cycles. The report on the effectiveness evaluation framework is available here. 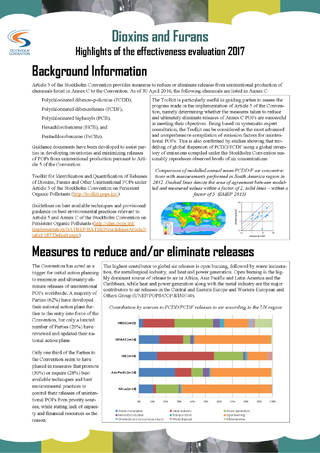 The committee concluded, among others, that the Stockholm Convention provides an effective and dynamic framework to regulate POPs throughout their lifecycle, addressing the production, use, import, export, releases, and disposal of these chemicals worldwide. However, inadequate implementation is the key issue that has been identified in the evaluation. Mechanisms and processes required by the Convention to support Parties in meeting their obligations have all been put in place, with the exception of procedures and mechanisms on compliance. A key challenge in undertaking the evaluation was the limited data available from national reports and national implementation plans, and recommendations have been made to address these and other implementation issues. 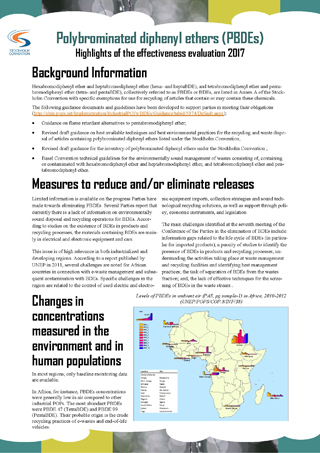 Monitoring results indicate that regulations targeting POPs are succeeding in reducing levels of POPs in humans and the environment. 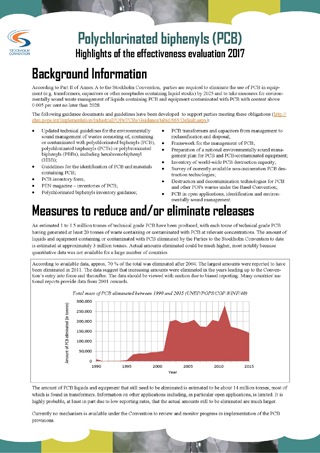 For legacy POPs, concentrations measured in air and in human populations have declined and continue to decline or remain at low levels due to restrictions on POPs that predated the Stockholm Convention and are now incorporated in it. For the newly listed POPs, concentrations are beginning to show decreases, although in a few instances, increasing and/or stable levels are observed. 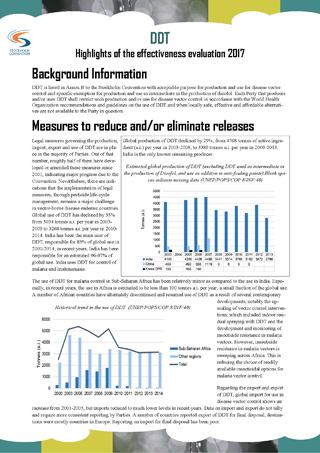 The effectiveness evaluation report is available here, and the executive summary of the report can be accessed here.